Nescafe does for me but this looks a good deal for coffee connoisseurs. Good reviews and reasonable stock. I have the plus version of this machine and it’s brilliant. I have gone through the whole “coffee journey” including everything from expensive espresso machines and grinders through to bean to cup and also other pod machines. The grinder/espresso machine option in theory will give you the best coffee. What I found was that it was to difficult to get that fantastic shot of espresso consistently - you had to get grind, pressure, tamp weight all 100% correct to pull the perfect shot - I couldn’t get good enough to get a perfect shot every time. The issue with the bean to cup machine for me was I would fill the bean holder with beans and then be stuck with that variety until it was empty unless I wanted to empty the bean container which was frankly a pain. I started my nespresso experience with their basic machine. This gave me a (for me) good quality espresso shot which was consistent every time. The only thing I couldn’t get was good milk. Using a milk wand manually gave me inconsistent results. I tried various milk frothers but I didn’t like these - I prefer steamed milk which these didn’t do. I then came across this machine. Not only does it do a good consistent shot it also steams the milk automatically. I do not know if there is a difference between my plus model and this one but with mine I can choose how hot I want the milk and how much foam. This is all programmed using the screen on the top of the machine - press the go button and it heats and froths the milk automatically and even cleans the steam wand once it’s finished. What I have now is consistency of quality and a variety of coffee flavours I can use any time. Save your money on these pod machines and get yourself a bean to cup machine. You won’t look back. Any of the delonghi range. With the milk jug will make it more expensive. But in the long run well worth it. I have the plus version of this machine and it’s brilliant. I have gone t …I have the plus version of this machine and it’s brilliant. I have gone through the whole “coffee journey” including everything from expensive espresso machines and grinders through to bean to cup and also other pod machines. The grinder/espresso machine option in theory will give you the best coffee. What I found was that it was to difficult to get that fantastic shot of espresso consistently - you had to get grind, pressure, tamp weight all 100% correct to pull the perfect shot - I couldn’t get good enough to get a perfect shot every time. The issue with the bean to cup machine for me was I would fill the bean holder with beans and then be stuck with that variety until it was empty unless I wanted to empty the bean container which was frankly a pain. I started my nespresso experience with their basic machine. This gave me a (for me) good quality espresso shot which was consistent every time. The only thing I couldn’t get was good milk. Using a milk wand manually gave me inconsistent results. I tried various milk frothers but I didn’t like these - I prefer steamed milk which these didn’t do.I then came across this machine. Not only does it do a good consistent shot it also steams the milk automatically. I do not know if there is a difference between my plus model and this one but with mine I can choose how hot I want the milk and how much foam. This is all programmed using the screen on the top of the machine - press the go button and it heats and froths the milk automatically and even cleans the steam wand once it’s finished. What I have now is consistency of quality and a variety of coffee flavours I can use any time. I have had this machine for about 15 months. The Plus gives you smaller steps between the heat and froth min and max settings and I think the Plus is supposed to heat up a couple of seconds earlier but otherwise very little difference. The Plus does occasionally go down to £270 on Amazon with some sort of Nespresso pod incentive (c£50 worth of coffee) but we're talking about 2-3 24hr price drops per year. 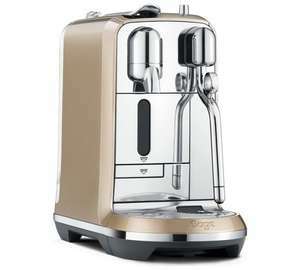 If you're in the market for a Nespresso machine this is a good price for an excellent machine. The steamed milk is far superior to the alternative Nespresso options.